The term "heavy lift ship" is ambiguous. By one definition, a heavy lift ship is an ocean-going vessel capable of submerging its large open deck to well below the water's surface, thus allowing another vessel to be floated over it and landed on a dry-dock-build mounted on the heavy lift ship's deck. The heavy lift ship then rises out of the water by pumping out its ballast tanks in a process very similar to the operation of a floating dry-dock. The transported vessel then rides on the deck of the heavy lift ship for the voyage to its destination. One method for transferring cargo that the US Navy currently utilizes is skin-to-skin transfer. This is currently done in very low sea states at anchor using a crane ship. The ships tie up alongside each other and the crane ship transfers ISO containers from one ship to the other. Boom-type cranes on ship are primary tools for transferring massive payloads from one ship to another. The payload operator is to ensure that the payload follows a desired path in a predictable and smooth manner. In planar operations, cable length and boom pitch angle are the basic control co-ordinates. In the presence of sea waves the ship and therefore the cable attachment point display unwanted motion. This influences payload operation and may even lead to unstable payload motion, both in-plane and out-of-plane. Such dynamics could seriously restrict effective operation periods. 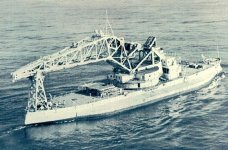 In 1920 the now-obsolete battleship Kearsarge was converted to a heavy-lift crane ship, intended to provide a mobile capability to handle large guns and other massive objects. This work, carried out at the Philadelphia Navy Yard, Pennsylvania, involved stripping away the ship's superstructure and replacing it with a huge crane rated at 250-tons lifting capacity. To ensure stability, Kearsarge's hull was fitted with side blisters that increased her beam by some twenty feet. She also retained her engines and some boilers. 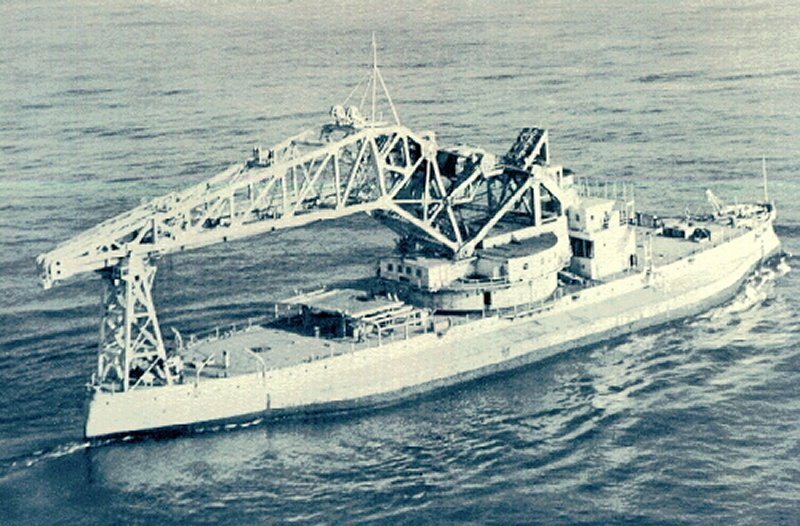 Carried on the Navy's register of ships as "unclassified", with the designation "Crane Ship # 1", she retained her original name until November 1941, when she was formally renamed Crane Ship No. 1. She had already (in April 1939) been redesignated AB-1. Beginning active service in her new role in the mid-1920s, Kearsarge spent much of the inter-war era on the West Coast, at the Puget Sound Navy Yard, where her work included regunning battleships. During World War II she was employed at East Coast shipyards, where she assisted in the construction of the battleships Indiana (BB-58) and Alabama (BB-60), among other chores. She was towed back to the Pacific in 1945 but came back east in 1948 to serve at the Boston Naval Shipyard. After more than three decades of unique non-combatant service, Crane Ship No. 1 was sold for scrapping in August 1955. In FY 1994 the Army established an interim Army Pre-positioned Afloat (APA) package to respond to major regional contingencies. The package consisted of an armor brigade set of equipment with doctrinal field artillery, combat engineer, air defense artillery, chemical, signal, logistics, and military intelligence support. Corps-and division-level combat support and combat service support units and 15 days of supply were also pre-positioned. The interim APA package had 12 ships: 7 Ready Reserve Force RO/RO ships with unit equipment; 3 Lighter Aboard Ships with a portion of the contingency corps' supplies; 1 T -class Auxiliary Crane Ship; and 1 Heavy Lift Pre-position Ship for port opening. The Auxiliary Crane Ships (T-ACS) are the product of the conversion of 9 container ships. An Auxiliary Crane ship is responsible for carrying equipment and supplies to support a potential contingencies throughout the world. It is essentially a floating warehouse which contains all the equipment and supplies needed to support up to 6,000 military personnel for 15 days and sustain contingency units arriving in the first 38 days of an operation. Each T-ACS has four 30-ton auxiliary cranes meaning it is self-sustaining - capable of loading or unloading cargo from itself or an adjacent vessel or pier. All the crane pedestals are on the starboard side of the vessel. They are good for "LOTS" operations, discharging containerships. They can off-load containers and outsize cargo from a non-self sustaining cargo ship offshore. The APS-3 vessels are home ported in Diego Garcia and Saipan, and are moved to the theater of operations as heightened tensions and other indicators foretell its use. The first element of APS-3 is the initial port opening package and could be the only portion of APS-3 committed for humanitarian operations, or it is the opening package for larger operations involving surge sealift. It includes a heavy lift preposition ship or FLO/FLO vessel, a one of a kind self-submergible vessel. The FLO/FLO submerges to discharge the Army watercraft that are on board. These Army watercraft provide the theater the capability to do in-stream off-load to augment the theater reception capability. It also includes a crane ship, to provide crane capability should the port become disabled or have no capability. In addition, the crane ship has Force Provider modules that can be used to establish the TSB. Finally, it includes two RO/RO ships that contain equipment such as RTCH, and other MHE and CSS equipment necessary to open the port. In 2001 the Advanced Shipboard Crane Motion System Advanced Technology Demonstration (ATD) initiated a pendulation control system demonstration for shipboard cranes at pierside and at anchor permitting ship-to-shore transfer of logistics through sea state three. It installed crane simulator/trainer for military operator training and conducted a demonstration of test ship roll simulation system. The Advanced Shipboard Crane Motion Control System ATD demonstrates a crane control system that combines recent advances in nonlinear control system technologies with existing strategic Auxiliary Crane Ship electro-hydraulic cranes. The control scheme controls load pendulation through sea state three by applying nonlinear control algorithms, appropriate to the ship motion environment, to the shipboard crane control system and the crane operator commands. This technology will extend the capability for ship to lighterage transfer of expeditionary warfare logistics to at least 300 containers per day in sea state three. Technologies will be developed to enable the transfer of standard ISO containers and other heavy loads from military and commercially available ships onto the sea base. These technologies will allow the ships to approach and safely remain connected while at sea in the sea base. Motion compensation for the ships and/or the cranes will allow safe and efficient transfer of containers and other heavy loads in moderate sea states. The effort will result in a series of demonstrations to provide a robust demonstration of the capability. The Deep Water Stable Craneship (DWSC) consists of two entities, a catamaran craneship and a detachable spar, which when connected form a self-deploying, open ocean capable trimaran. The spar can be rotated through 90 degrees, from horizontal to vertical, using seawater ballast. When vertical, partial de-ballasting 'lifts' the catamaran clear of the water surface allowing the system to operate as a spar and take advantage of the superior seakeeping afforded by the small waterplane area. The concept was inspired by the 'ONR owned' and 'Scripts Institute operated' FLIPSHIP, and was developed as a potential solution to the Seabasing goal of transferring containerized cargo at sea between large and small vessels in seastate four (significant wave-heights 1.25-2.5m). Current crane operations at-sea are limited to seastate two (significant wave-heights 0.1-0.5m), largely due to pendulation of the load. Saipem has converted the former vessel "Maxita" into a fully redundant DP Heavy Lift vessel named "Saipem 3000" by replacing a completely new stern section and installing a CLYDE 76 model 2,400 st crane. The new configuration consists in a monohull unit with the following particulars: length 162 m, breatdh 38m and depth 9m, self-propelled, with heavy lifting crane, associated to a DP system Class 3. The vessel will be suited for worldwide operations in the most severe environmental conditions. The main crane (with relevant tub foundation) has been dismantled from the HLV named "Pearl Marine" and erected into the stern. Main crane foundation has been integrated into the new structure on which two azimuthal and retractable thrusters for propulsion and for dynamic positioning are installed. The A-frame of Clyde crane has been shortened in order to reduce our draft for passage through Suez Canal.